i’m not gonna lie…as far as i know, i have no french roots….and i really can’t give you a detailed account of what Bastille Day actually is (just a general one that usually ends with a question mark inflection). BUT…what i do know…is that it’s NEVER bad to have an excuse to eat french pastries….so Happy Bastille Day it is! whisk together your flour and salt. add in water. stir until dough has formed. dough will be a tiny bit on the lumpy side. set aside and let her rest for about 20 minutes. roll out into a rectangle 1/2 inch thick. after the top of your dough is covered in butter squares, fold it in thirds (like you would a business letter) and roll out again to about 1/2″ thickness. be careful to not let the butter break through the dough or out the sides. (first fold) turn the dough 90 degrees and roll out again into a rectangle and fold again into thirds. (second fold) it’s important to keep your dough chilled, so between every two folds refrigerate for 30 minutes, covered. you will repeat this process of rolling out and folding two more times…refrigerating between every two folds until you have folded the dough 6 times. once finished, wrap and refrigerate. using your chilled mixer bowl and beaters or whisk attachment, beat the remaining 1 1/2 cup heavy whipping cream at a high speed till you begin to see distinct lines forming in the cream. with the beaters still going at high speed, pour in your cooled, sugar/cream/vanilla mixture. the next part happens pretty quickly, so pay attention. continue beating this mixture till it forms stiff peaks, being careful not to over-beat. remove dough from fridge and cut off a fourth. roll out your dough into a rectangle – about 6″ x 16″ and 1/8 of an inch thick, focusing more on the thickness than the length. once rolled out, prick all over with a fork. sprinkle a cookie sheet with water, shaking off the excess and transfer your dough to the cookie sheet. bake at 425 for 20-25 minutes – dough will be puffed up and golden. transfer to cooling rack. i actually put mine in the fridge to cool which helped when it came time to cut the pastry. once cooled, gingerly cut your puffed rectangle into three long strips. (it helps to use a wet serrated knife) then cut each strip through the middle leaving you with six strips – three tops, three bottoms. i went ahead and cut mine down to napoleon single serving sizes from there. on the bottom layer slap on some cream and berries (i picked strawberries) or chocolate shavings/sauce?! – whatever you love the most. add the top layer and sprinkle with confectioners sugar. go ahead and add another dollop of whipped cream for good measure, and some more berries while you’re at it. serve immediately – or chill until ready. it might seem like quite the ordeal from start to finish….but the good news is….once you make a batch of puff pastry….you will have plenty to experiment with. 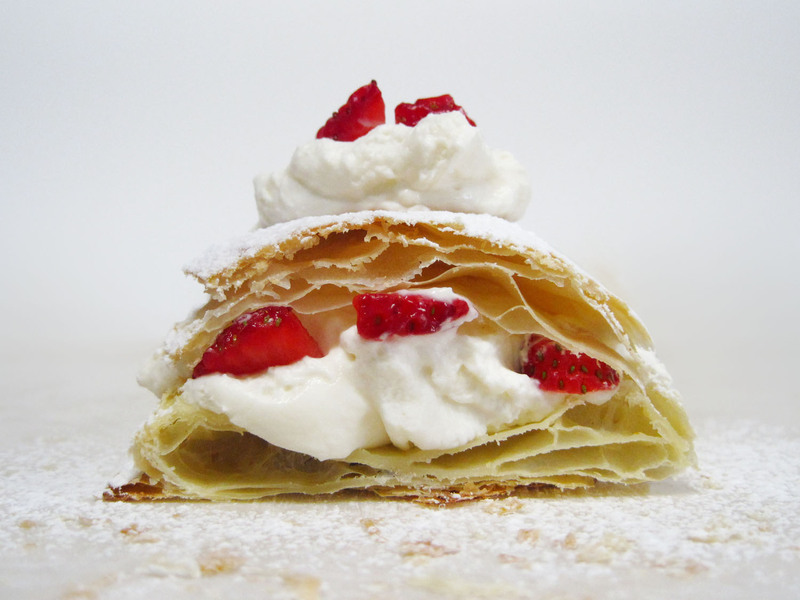 be it cream horns, croissants, or napoleons….there will be enough to go around. AND you will feel oh so accomplished and fancy making anything french!